Though many TVB artistes have decided to leave the station to “dig gold” elsewhere, many former TVB artistes are also coming back. Kingdom Yuen (苑瓊丹), who has been building a steady acting career in Mainland China in the past few years, will be returning to TVB this month to film the comedy drama Triad Boss Under the Line of Fire <火線下的江湖大佬> with Kent Cheng (鄭則士). Kingdom’s last TVB drama was the historical series King Maker <造王者>, which aired in 2012. Liu Kai Chi (廖啟智), who left TVB after filming the underwhelming fantasy drama series The Winter Melon Tale <大冬瓜> in late 2007, will be filming the drama Legal High <律政強人> with Alex Fong Chun Sun (方中信) at the end of the year. The legal drama will be Liu Kai Chi and Alex’s first collaboration. A sales production trailer for Legal High was already filmed last month. Michael Tong (唐文龍), whose last TVB drama was the 2006 adventure series The Biter Bitten <人生馬戲團>, confirmed in an interview that he is in talks to return to TVB to film a drama. The 45-year-old said TVB approached him two years ago about a possible collaboration, but the actor was unable to engage in final negotiations until fairly recently. Michael shared that he was originally supposed to star in the crime drama Eye In the Sky <天眼> with his friend Kevin Cheng (鄭嘉穎), but he had to pass on the role due to scheduling conflicts. His role was ultimately handed to Ruco Chan (陳展鵬). Michael was then offered a supporting role in Blue Veins <殭>, which also starred Kevin, but he turned it down as he was unsatisfied with the role’s screen time. Great news that Kingdom Yuen and Liu Kai Chi will be back with TVB. Not too sure about Michael Tong though. Was never impressed by him and fortunately for us, it was Ruco who played opposite Kevin Cheng in EITS instead of him. Ruco is far far better than Michael in all departments. @freedalas Ruco was not first choice?? @funnlim It says in the article that Michael was originally casted for Ruco’s role but due to conflicting schedule, it was given to Ruco. I can’t imagine how that role would turn out to be had Michael took it on. Definitely can’t be as cool, suave and deep in character as Ruco. @freedalas I am so happy for Ruco…he did a great job as baddie in 天眼. @freedalas although the role was originally given to Michael, Ruco did a great job portraying the villain opposite Kevin. in any case, TVB needs actors like Kingdom and Kai Chi. @janet72 Yes, Ruco certainly did a great job in EITS. No doubt about that. There are now a few dramas that is watchable mainly because of him as a lead. ROE and COD are 2 good examples. @freedalas Luckily for drama viewers, MT had to pass on the role and Ruco took over. This is news though as there was no mention previously about Ruco being the replacement. @isay Totally agree. This is one replacement of a male lead that we all fully embrace, unlike Tony Hung for Raymond Wong for COD, a poor poor replacement. @freedalas poor tony had to take the role of CPT which is totally unsuitable for him. what in the world is TVB thinking? Ruco’s portrayal of 11th prince and Bowie is awesome…he deserves to win 2nd time in Singapore. @freedalas Michael tong and kevin cheng can play brothers since they are of the same age…but seriously doubt Michael can carry off the role well in EITS. Michael is rather 木 while ruco is versatile. Michael Tong is only 45?? He was like in TVB ages ago. A boring actor but he does look good if that is his picture. @funnlim 45 is quite an acceptable age for him, because if he appeared on screen 10 years ago his was 35 back then if it was 20 years ago he will just be 25 back then. Taking into consideration that most artist start appearing at the age around 18..Haha, I have the same thought as you! Time used feel longer in the past ,but nowadays it’s different. 2010 by the sound sounds like 2-3 years ago but is has already been 5 years ago and going 6! @alien MT at 45 still looks ok.
forensic heroes 3 was shown in 2011, ruco has aged quite a bit. men usually age well…but with such a punishing filming schedule in tvb, it’s hard to look good. @funnlim Michael Tong is always handsome in his look though he is a bit short. Kent Tong was not great in his acting when he was young in TVB, but he acted so much better in “Lord of Shanghai”. Hope Michael Tong has improved a lot in his acting as TVB is so short of good siu sangs. @orchid123 definitely short of young actors. a lot of ‘uncle’ type and if pair off with younger actresses, they will look like father-daughter. Nice.. I like all 3 of them..Especially Liu Kai Chi! @happybi even better if Kai Chi’s wife returns. @janet72 If only!!! I love her but she may be busy with their kids as I think 1 of them have medical issue. @happybi I also wonder what happened to veteran actress Chan Kar Yee after she left TVB? I rarely heard any news about her. The last TVB series I saw her in was Just Love II. Is she retired or switched to another Tv station? It would be nice to see her come back to tvb. @unknown Liu Kai Chi’s wife is called Chan Man Yee, not Chan Kar Yee. I also wish to watch her again in TVB drama series. @orchid123 Lol, you misunderstood me. I am talking about another actress. @unknown Who is Chan Kar Yee then? @orchid123 Chan Kar Yee a unpopular veteran actress. She plays a lot of minor and supporting roles. If you’ve watched Just love you would know who she is. She acted as Jessica hsuan’s mother in Just love II. @unknown Okay, I got it. Thanks! I haven’t watched her drama series for a long long time. Thanks! @orchid123 ehhehe yeah you got the wrong person. @unknown is talking about another veteran actress who really haven’t been seen for a while. @happybi Yes, her son is suspected to be gay. And because Liu and her are staunch christians, it became fodder for the paparrazis at that time when rumor of his sexual orientation surfaced. Good to see Kingdom and LKC back. 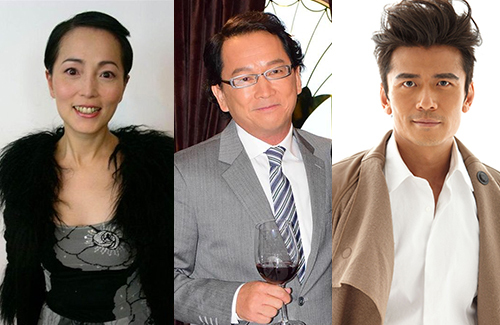 Great actors that had limited/insignificant roles at TVB in the last decade or so. Would like to see them in more prominent roles. Not a fan of Michael Tong, got the looks, but can’t act. Kingdom & Uncle Chi, yay! MT is a looker but not very good with acting. I remember him & Moses came out at the same time. I didn’t understand why they promoted Moses but not him since he was much better looking lol. Now I know. MT made it outside tvb? He sounds like a big shot? In EitS, Ruco & MT would’ve pulled off the twin thing much more fitting than Kevin – purely on appearance wise. Don’t understand the hype about these people returning to TVB. Never missed them at all. @isay First, TVB is short of artistes. Secondly, since HKT will not be able to have its free TV station licence, some artistes would need to get a job with steady income in Hong Kong. Not everyone wants to live permanently in Mainland China ……………… different life styles and different cultures. @orchid123 What i meant is why all the excitement about them returning to film dramas for tvb? Their acting ain’t great. @isay Depends what you like. Michael Tong is good looking and if he has polished his acting, he will be a good siu sang for TVB. Liu Kai Chi is a bit old, but he acts well. With a custom-made character, he will act really well. As for Kingdom Yuen, I never liked her. She speaks her dialogues in the same manner in all types of roles. She isn’t young or good looking. However, I guess she would fit into certain characters though. @orchid123 That’s easy. I like none of them. Don’t like Kent Cheng either. Used to think MT was cute but that guy can’t act at all. @orchid123 the culture is so different in china…if not for money, I doubt artistes want to be permanently based there. but not all make it in the Mainland. they have to be good enough in HK first. Kevin Cheng, Raymond Cho and Micheal Tong appeared in the movie “Boys?” (假男假女) back in 1996. Seems that they have maintain their friendship until now. They wouldn’t have come together to do this script project on their own accord if it they weren’t. Happy to see another long friendship in the E-industry. Reminds me of ‘Alive’. @kidd Michael Tong and Raymond Cho seem to be easy-going persons. The only difficult one could be Kevin Cheng, but again he would get along with certain types of colleagues. @orchid123 Raymond Cho and Kevin Cheng has very similar past experience. I remember listening to their interview with Anna Yau in RTHK (on separate day) and was struck by how similar their experience was. They both started out as singer, both struck the bottom until their were dead broke, and then both rise back up through TVB. @orchid123 Arrogant and self-confident is just separated by a thin line. I think Kevin Cheng is still figuring this line. If you watch/listen to his past interviews before his success in ‘Scarlet Heart’ and ‘Ghetto Justice’ you will see a shy person who is very uncomfortable in front of the camera. His interviews even bother on the boring side (I felt this way when I listen to his interview with Stephen Chan because content was the same as the Anna’s) due to his reserve. Arrogant and difficult will be the last words you can use to describe him. I think the success and acknowledgement he gained from ‘Scarlet Heart’ and ‘Ghetto Justice’ gave him a boost in self-confidence and made him more open up. But, changing from a formerly reserve and maybe diffident nature to a confident one, he needs adjustment. Maybe he has gone to the other extreme while trying to be more outgoing/extrovert. In the Anna Yau interview, he has said that his parents were both often not at home when he was a child and he only has a nanny and the TV to accompany him. So, he lack communication skills. Jazz Lam defended him strongly when people criticized him for being arrogant/not smiling. If a person is really that difficult, would a co-star defended him so strongly? I also remember reading in a blog (I couldn’t find it now) many years ago. The blog post is about Kevin and it mentioned one incident where Wayne Lai was having some personal problem and after filming ended and everyone has left, he stayed back and Kevin stayed back with him. Kevin didn’t say much but, Wayne appreciated that quiet gesture of support. So, when reports first came out saying how arrogant and difficult Kevin is, I couldn’t believe it. Maybe he really has changed, I don’t know. @kidd I do agree with you. But Kevin do seem a little arrogant these days. In the past like what you said, he was more of a reserved and shy guy, and haha a mummy’s boy. However, maybe like what you said he might have gone on the more extreme part of being a more confident person now. @kidd Thanks, Kidd, for giving me an update of Kevin Cheng. I heard a lot about him from different sources. I agree that a child’s upbringing would have a significant impact on the person’s personality. I also know Kevin Cheng is a quiet person who does not like to socialize with people. Perhaps that is the reason why he is not popular among his colleagues. In terms of his real personality, I guess only his family and close friends would know. I think Michael Tong was also brought up in the States, and he and Kevin Cheng have something in common. Raymond Cho is super popular among his friends and has tons of friends. However, I am glad that Kevin Cheng, Michael Tong and Raymond Cho have been able to keep their friendship throughout these years, which is not an easy thing in the entertainment industries. @orchid123 I was never under the impression he was unpopular amongst his colleagues. He did seem reserved but when he made friends, he made loyal steadfast friends. So he is a slow burn sort of person. Never had the impression he was arrogant as well. Maybe the botox is not helping but I remember writing a short essay on him and I still stand by what I say. Before BBJX he never knew how to play the fame game. He was reserved, quiet, mature. Some may deem him unfriendly but I feel he is just overly cautious. After BBJX he became more open, and proves he can handle fame very well in a mature way. I love his replies in interviews and he found a girl who talks the same way but more people savvy than him. Don’t mistake being reserved as arrogance. You will know arrogance when you see it. Put it this way; not all stars are so media savvy, people friendly, gossip expert, etc etc. Having seen Kevin in person, and the way he interracts with people, he was to me more genuine than Raymond Lam who was standing next to him. His past self was Kenneth Ma (who is now publicity shy, and reserved, slow burn person), he won’t be Nicky Wu anytime in handling the media but he is getting there. There is a certain genuineness and sincerity in the way he interacts with his fans and public and I feel accusations of him being arrogant, fame got to his head is all very unfair. For someone who was mega famous for a period of time, he handled the pressure well. @funnlim When I said “not popular”, I did not mean “unpopular”. Though in dictionary, they could mean the same. Compared with Raymond Cho, Kevin Cheng is not as popular as Raymond Cho who has many many friends. I don’t call Kevin Cheng “arrogant” either. Anthony Wong is arrogant, but not Kevin Cheng. Kevin is a more reserved, shy, and quiet person. He may not know how to speak well, but he does not criticize his colleagues. I like Kevin’s look, but not too crazy about his acting. He is not bad when he has a good role to act. However, I didn’t like him in portraying his lawyer’s role in “Ghetto Justice 1” or “Ghetto Justice 2”. @orchid123 Not crazy about his acting either. He does well with comedy but when it is a serious role, he doesn’t always pull it off. He is aging well though. Anthony is arrogant. Never a fan of him. Yes he can act but not a fan of him at all. @orchid123 I actually like his portrayal of Summer in “Only You”, which air on the same year as “Ghetto Justice”, more than his portrayal on Law Ba. I think his acting is more natural as Summer. @kidd Same with me. The only character that I really didn’t like was Law Ba. Kevin Cheng was exaggerating too much in that character. @orchid123 don’t know much about kevin cheng’s past…but based on recent news, he is mummy’s boy and arrogant after the 步步惊心 revival…of course now that he has robbed the cradle – grace chan. oh yes, I don’t like Anthony and kent tong. @janet72 wow one drama that shot you to super-stardom and you become arrogant? tsk tsk Kevin Cheng if it’s true. BUT like @orchid123 said, only Kevin’s true personality is known to his friends and family members. I would count his girlfriend Grace but it seems like they are still in honeymoon stage still. @riceball120 their relationship is definitely in honeymoon stage…probably 7-8 months? during the Scarlet Heart period, I was nuts over 八爷, more than Nicky Wu. @janet72 agreed! but I think it has to do with the fact that I totally prefer gentle, loving men over men that hides their feelings. Men like Nicky Wu’s character bothers me, but that just a personal standpoint. @riceball120 i share the same view. I prefer men who show their feelings…nicky’s character in scarlet heart is scary…neither here nor there. at least with kevin, he went all out with flowers and romance. Haha. I didn’t know Kingdom Yuen’s name is Kingdom till now. Lol. I love Kingdom and LKC. But not Micheal Tong. His acting is woody, and now getting older liao. He look like Linda Chung’s maybe ex bf. I just don’t understand what tvb is thinking. Why bring in an old actor like Micheal now to be the next siu sang??? I mean, don’t expect him to wanna act someone’s father rite?? At least the other 2 will not mind be father or mother or grandpa grandma. Y not try to polish Fred Cheng instead? He is woody, but at least good looking and younger lei….. And I hope tvb will gives good roles to Ruco first, rather than Micheal…. @dramadrama A play on her Chinese name perhaps? I was hoping Fred gets cast in Lord of Shanghai in Matt’s role. Fred is the right age. Unfortunately TVB can’t fill Matt’s friends’ roles with equally youthful looking actors so Matt had to do. By the way WHY in flashback Anthony becomes Kenneth but the rest is the same actors?? @funnlim matt and fred are barely 2 to 3 yrs apart in age lol. That’s not a lot of difference. It’s just that Matt seems older cos he’s been around longer and in a lot more series than fred. Acting-wise it’s matt over fred anytime. @dramadrama this one I totally agree with you…please give the good roles to RUCO first. linda chung’s ex doesn’t impress me…Michael tong is better looking. he can taken on the role to be father of a young kid. wow I cant wait! I miss Kindom yuen the most!